Whoever knowingly and willfully...makes any such threat against the President, President-elect, Vice President or other officer next in the order of succession to the office of President, or Vice President-elect, shall be fined under this title or imprisoned not more than five years, or both. - 18 U.S.C. sect. 871. 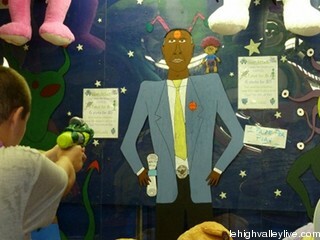 That being said, it is a little unnerving, to say the least, that a Church Carnival (of all places) in Roseto, Pennsylvania decided that it would be a good idea to put up a game where people can win a prize for shooting the current and 44th President of the United States, Barack Obama. Kathryn Chapman took a trip to the annual Our Lady of Mount Carmel Big Time celebration last weekend, and she was shocked to see a shooting game with President Barack Obama as the target. "I just can’t believe how far things have come that now on church property you can shoot the president and get a prize if you hit him in the head or heart," said Chapman, a Medford, Mass., resident who last lived in Roseto the year President John F. Kennedy was assassinated. She was in town for a family reunion. Even though the game shows a black man dressed in a suit, holding a scroll labeled "health bill" and wearing a belt buckle that features the presidential seal, Goodtime Amusements President Irvin L. Good Jr. said the image does not portray President Obama. Good reports speaking to two people with complaints about the game. Of one complainant, he said, "She said she was offended by it. I said if you are, you might want to be. But you’re interpreting it as being Obama. We’re not interpreting it as Obama." Chapman confronted the game owner, who claimed "freedom of speech," she said. Her husband, Richard Shultz, said he would have complained no matter the political party of the president depicted. "The message … step right up and shoot the president — I mean, c'mon," he said. "In my lifetime, two presidents have been shot and I don’t think we should have that as an amusement game." The Rev. Jim Prior, pastor of Our Lady of Mount Carmel, said he would have put a stop to the game had he seen it during the carnival. A parishioner didn't complain until after Big Time was over, he said. Also per the Associated Press, the game was called "Alien Attack" where players could win prizes by shooting darts at little green science fiction aliens and at a man in a suit with a belt buckles stating "The Prez Sez" with a copy of a bill in his hand that states "Health Bill." OK, first things first, let's not play the dumb role here, folks - that IS President Barack Obama. That entire argument from the game producer about the image above not resembling the President is insulting to our intelligence. CLEARLY it is a depiction (albeit a poorly drawn one) of President Obama. You don't get to deny liability simply because you have the artistic skills of a 5-year-old. Second point of order, when the game producer responded with "Freedom of Speech" when confronted about the game, that not only confirms his admission that this is, in fact, a depiction of the President, but it is also legally incorrect. As a threshold matter, 1st Amendment free speech is not an absolute right. Contrary to popular belief, you can't say ANYTHING you want in America and then hide behind "Freedom of Speech." Although we enjoy great freedom under the 1st Amendment, there are a few things that you cannot say, and threats toward the President just so happens to be one of them (see 18 U.S.C. 871 above). Thanks in large part to the 24/7 main stream media news cycle, we have become somewhat desensitized to what is real and what is spin in this day and age of "anything goes" partisan politics. However, lest we forget the lessons of the past, we would do well to observe that threats against our President, be they symbolic or literal, are no joking matter. There is another hit Obama carnival game at the Jersey shore too!